Gum disease affects about half of the US population, so why don’t you hear about it more? This infection or inflammation of your gums can lead to permanent damage like tooth loss, and it can affect your overall health if it’s left untreated. Thankfully, the earliest stage of gum disease can be reversed, which is why it’s important to recognize the signs and symptoms. Keep reading to learn about the stages of gum disease and what signs to look out for from your dentist in Washington, D.C. The most common cause of gum disease is poor oral healthcare. When plaque and bacteria aren’t cleaned away through routine brushing and flossing, it infects your gums, teeth, and the surrounding bone structure. This is the earliest stage of gum disease. It’s an inflammation of your gums caused by plaque buildup at the gumline. Plaque produces toxins that can irritate your gum tissue and cause gingivitis. The damage that it does can still be reversed because it hasn’t affected the bone and connective tissue yet. At this stage, the bone and supportive tissue that hold your teeth in place are permanently damaged. Your gums may start to form tiny pockets under your teeth, which traps more plaque and bacteria. Better oral healthcare at home combined with proper dental treatment will typically prevent anymore damage. In this final stage, your teeth may begin to shift or loosen because your supporting bone and fibers that hold your teeth in place are ruined. 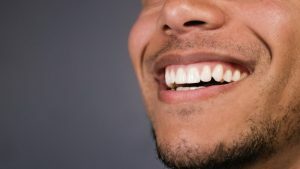 This can affect your bite and if your disease has been left untreated for long enough, you may have to have some teeth removed. Now that you know more about gum disease, have you noticed any of the above symptoms? Contact your dentist to get the treatment that you need while this disease is still in the earliest stage. Dr. Yelena Obholz is a skilled dentist who has extra training and experience in periodontics (the study of the gums and supportive tissue). She knows how common gum disease is, which is why she wants you to know about the different stages and symptoms. She currently practices at Aesthetic & Family Dentistry of Washington, and she can be contacted through her website or by phone at (202) 364-8989 for any questions.